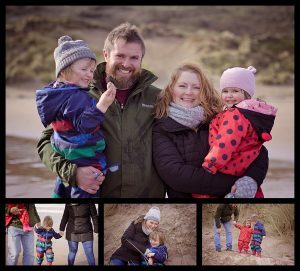 When i got the call asking if i was free to do an outdoor family shoot at Whitepark Bay, there was an instant YES! As an outdoor family photographer in Northern Ireland this is thee best phone call to get. If you are interested in booking a family shoot then check out my 12 tips for a family photo session CLICK HERE. Ive been asked again and again by this little family to photograph their milestones, and i have loved every single photoshoot. Today they just wanted to photograph their everyday normal. This little family is my tribe. They get the whole concept of capturing memories and everyday normals. The everyday normals is where the joy lies. It was also an opportunity to allow the lovely Murron to join us for a work experience placement. Ill ask Murron to do a blog at the end of the whole experience, itll be lovely to hear what she thinks of the whole experience. But thats for another day. For those that havent been there before it a lovely little stretch along the North Antrim Coast. An an outdoor family photographer in Northern Ireland its important to be open to families special places. I am truly touched when they share why the place holds so dear to their hearts. Northern Ireland has so many beautiful little pockets of pure loveliness. So on our photoshoot what did we get up to? Nothing, we had a dander down, the car park is pretty small so i would guess in the height of summer it would get busy really quickly! Its a good 15 minute walk down onto Whitepark Bay so if you havent been before, just make sure you remember everything from the car! * Whitepark Bay is a National Trust property and if you CLICK HERE you can see everything they recommend you can get upto. I know i can go on and on about outdoor family shoots but genuinely they are so much stinkin fun! There is something about being outside, away from the dishes & laundry, that allows Mums & Dads to breathe. The great outdoors, rain or shine is a lovely place to be to soothe your soul. Kids love it as well. Welly boots on and away we go on bear hunt. Once onto the beach we let the kids just explore and play. The talk about the picnic lunch was never far from the conversation. Lots of joy looking forward to their sandwiches & cheese that was waiting for them in the car. We even discovered a new game! The name escapes me Sandstorming maybe. Anyho ignoring my forgetful grey cells we spent ages running up and down the sand dunes. So many giggles and laughter. Kids can find the joy and fun in the simplest of tasks. lets find a pebble !! Look at this wee woman, rosey cheeks just gorgeous. I first met her as a newborn baby a few weeks old. The changes have been phenomenal, kids change in a blink of an eye. I remember reading somewhere that time with children flies by, before you know it they are 18. However that hour right upto bedtime can last a lifetime. Its so true. When i go back to photography my families they dont necessarily see the changes. But to me they are astonishing. Seeing little ones being up and stomping everywhere is brilliant. How on earth could being an outdoor family photographer in Northern Ireland be such a lovely job? With lovely clients that keep coming back i truly feel so thankful. If you are interesed in booking a family shoot then please drop me a wee email. Click here for the link to my Contact me page and from there just pop in a few details and i can come back to you. I promise you the shoot will be so worth it, remembering the kids and yourselves on a normal Sunday afternoon, thats where the joy lies. Family photographer in Belfast Mel Hudson is a childrens and family portrait photographer. 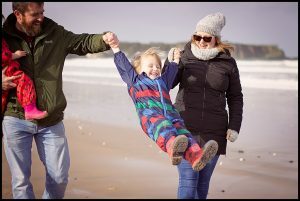 Based in Carrickfergus, Co Antrim, Mel Hudson Family Photography travels all over as an outdoor family photographer in Northern Ireland. These photographs are beautiful. I must book in, we have a crazy family of 5.